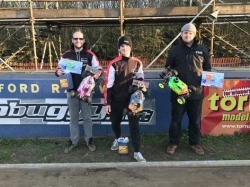 Coventry hosted the first rounds of the summer NitroXCross race series and we had a large presentation of drivers attending this event. The track was in very good shape after a tough winter, the first round was extended to allow for some practise for the drivers, the BETA tires were working very well on the mixed surface track. After qualifying we had William Skidmore in third, Joni Skidmore in 6th and Jon Hazlewood in 7th, making for 3 AGAMA’s qualifying straight into the main final, Rob West qualified into the B final but took one of the bump up spots into the A final. Joni and Jon both had good starts, William Skidmore took the lead for a large portion of the final, until some racing incidents meant he dropped down in the field, Joni soon starting to pull in the positions in front of him then took the lead position, he held this all the way to the end. Jon Hazlewood had a consistent final run and took the final podium spot. On the Sunday the second round was hosted, with the nitroXCross one round is hosted on the Saturday and another separate round on the Sunday. After Qualifying we had Rob and Jon in the A final. Steve Guppy from Manslton models had a tough qualifying starting in the D, but some super driving allowed him to bump into the C and then the B final. Good Job Steve. The A final was up last, Jon and Rob both had very good pace. 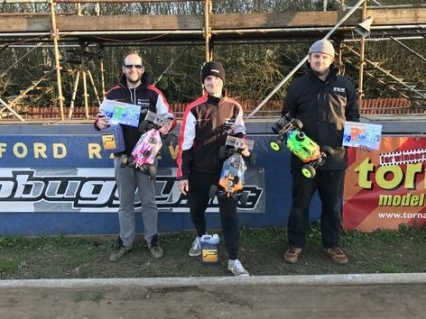 A bumpy start for Jon meant he had to climb up the field to get a podium position, but some consistent driving and good grip levels allowed him to again take the last podium spot. Thank you to Coventry for prepping a very enjoyable and fun track also to the organisers of the NitroXCross race series. Next weekend we will be at NDOR for the first round of the BRCA National series.